As we age, the skin's natural processes of renewal begin to slow and skin loses elasticity. Regenerating Neck and Décolleté Cream supports the skin's natural powers of renewal. Skin is hydrated, refined and revitalized for a smoother, more supple appearance. The appearance of wrinkles is diminished, and skin looks and feels firmer. Formulation: Rich in essential fatty acids and antioxidants, coconut, argan, jojoba, sesame, sweet almond, macadamia and sunflower oils smooth and protect the skin from drying. Red clover, acerola berries and shea butter, help enhance skin tone and support elasticity. Antioxidant-rich pomegranate is blended with rose extract to help support natural skin renewal. Silica-rich horsetail, helps fortify and firm the skin. Witch hazel distillate and marsh mallow leaf extract support the skin’s moisture balance. I love the feeling on my skin after I started using it. The smoothness of the skin and the elasticity in over just one week. I was a little skeptical about a cream like this but in a week I saw a definite difference in the equality of my neck and décolletage skin. Will definitely continue to make this a daily regimen. As I am approaching 50 this is just what I was looking for to help minimize the aging appearance of lines on my neck and chest--especially in the AM. This cream has really improved the look of my neck and décolleté. Just the extra care my mid 60 year old skin needed. Bought this for my mom and she is absolutely thrilled! Only used for a short time but bought it based on a recommendation from someone who has been using it for over a year and sees the improvement. Keeps my skin feeling hydrated for eight+ hours and smells delicious and relaxing, from the natural ingredients. Thanks for the integrity of your products and this formula, in particular. I could tell a difference in my neck after a week of using this cream. I notice much softer skin and less noticeable wrinkles. I love the change in my skin since adding the Regenerating Neck and Décolleté Cream to my skincare routine. It has really made a difference to the texture of my décolleté and helped even out my skin tone. My neck was starting to get that dryish, droopy alligator look. This is nice and light and like other Hauschka products I use.. has a subtle pleasant fragrance. It goes on very nicely so you're not feeling the urge to RUB/PULL your skin. My necks feels and looks so much smoother. Would definitely buy again! I'm loving this line of creams. They absorb really well and my décolletage is looking more moist and fresh within the first week of use. This cream is not greasy and leaves the skin supple and I will buy it again. Again, I went with a trial size in case I didn't like it, but this in one week has transformed my neck and decollete skin. I look fresh, young and smooth, and multiple folks have commented! I am liking it well so far and look forward to seeing more improvement with continued use. Really wish I had started on it 10 years ago though! Saw a difference. I had used a perscription cream a few years ago but was too strong and caused irritation. 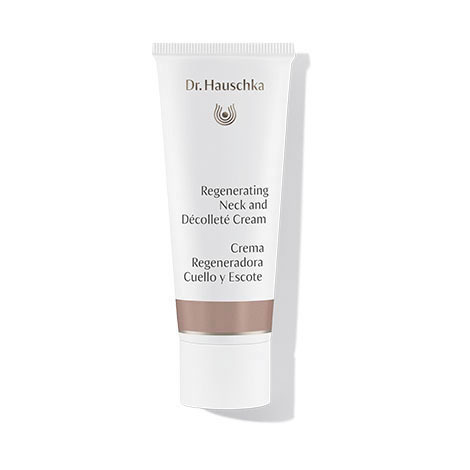 No irritation with Dr. Hauschka. No more lines whatsoever on my neck! I absolutely love Dr. Haushka products and I have tried A LOT of different things over the years. At this point I will only use organic products and many of them, while having good ingredients, do not sit well on the skin or are not effective or both. This is not the case with Dr. Haushka--they have mastered both formulation and efficacy. In the morning after cleansing with Cleansing Cream and toning with Regenerating Serum, apply to the neck and décolleté. Daily care with Regenerating Serum, Regenerating Day Cream, Regenerating Eye Cream and Regenerating Body Cream. Weekly use of Firming Mask. Seasonal use of Renewing Night Conditioner and Regenerating Intensive Treatment or Intensive Treatment for Menopausal Skin.